ALVA, Okla. – Sara Bynum can see the finish line to her college rodeo career. 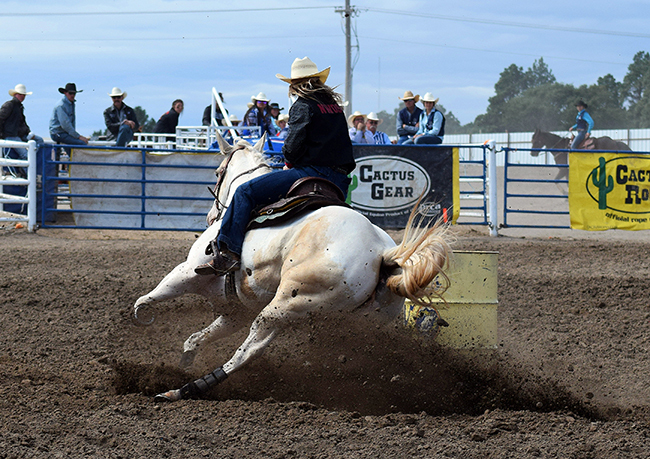 She leads the Central Plains Region’s barrel racing standings by 135 points with one event left on the regular season. She is guaranteed her spot to compete for the national championship at the College National Finals Rodeo in June. Now she just wants to finish business this coming weekend in Guymon, Okla.
“It would mean the world if that’s how we left it,” said Bynum, a senior at Northwestern Oklahoma State University from Beggs, Okla. This will mark the third straight year she has competed at the CNFR, and she moved even closer this past weekend by winning the Fort Hays (Kan.) State University rodeo. She placed third in the opening round with a 17.86-second run, then won the championship round in 18.26. What’s more impressive is that she’s done so much on her 8-year-old paint mare, Loretta, a horse her family acquired four years ago off an add on Craigslist. When the tandem arrived in Alva four years ago, both were green to the college rodeo life. They’ve grown together and, now, they’re on the verge of a regional title. The training has worked this season. She and Loretta have been one of the driving forces for the Northwestern women’s team, which is battling Southeastern Oklahoma State University for the regional title. The Northwestern women finished second behind their rivals in Hays, getting a little bit of assistance from goat-tier Jenny Massing of Ponoka, Alberta; she finished in at least a tie for third in both go-rounds and earned third-place points in the average. Breakaway roper Cassey Woodward of Dupree, S.D., placed in the first round but was saddled with a no-time in the short round to fall out of the average. The Rangers men also finished second in Hays, led by the all-around champion Maverick Harper, who earned his second such title in as many weeks. He won the tie-down roping and finished third in steer wrestling. Grayson Allred of Kanarraville, Utah, also scored points in both those events, finishing third in tie-down roping and fifth in bulldogging. Cole Patterson of Pratt, Kan., placed in the opening round of tie-down roping but failed to earn a time in the short round. In steer wrestling, Talon Roseland of Marshalltown, Minn., placed second, while Cody Devers of Perryton, Texas, finished fourth; Devers leads the region standings by 95 points over Roseland. Bridger Anderson of Carrington, N.D., won the first round but didn’t place in the average. Team ropers Logan Wood of Prescott, Iowa, and Edgar Fierro of Hennessey, Okla., placed in both rounds and finished second in the average. Heeler Sage Lamunyon of Enid, Okla., placed third in the opening round, but he and his partner, Layton Little of Southwestern Oklahoma State University, failed to secure a time in the short round. Both the Rangers men and women have a virtual lock on qualifying for the college finals as teams. The men are a solid second place, with a 1,477-point lead over the No. 3 team. Only the top two teams and the top three finishers in each event advance to the CNFR, set for June 10-16 in Casper, Wyo. Bynum has held onto the barrel racing lead for much of the region season, but she has no plans to back down now. She’s learned too much over her four-year campaign to slow down heading into the final regular-season event of her career. “I had never really had a horse like Loretta,” she said. “In the back of your mind, you want to prove to everybody how good your horse is. Our region is super tough. That mindset has been beneficial to the young cowgirl, who is a veteran in the eyes of college rodeo. But she and Loretta have grown up together and grown on each other. “Loretta is pretty free running,” Bynum said. “I had to rein her down on her first (barrel), or she’d go past it. At 4 years old, I had to be more of a jockey for her. Now I know I can just send her, and she’s going to look for a barrel. I’ve ridden smarter this year. Though the school side of college rodeo has been tough on Bynum, she’s stuck with it. She plans to graduate in December, and she knows her ride through college rodeo has been the key. “I’m going to get my bachelor’s (degree), and I have that paint mare to thank for it,” she said. We ALL at BEGGS OK are so proud of you.